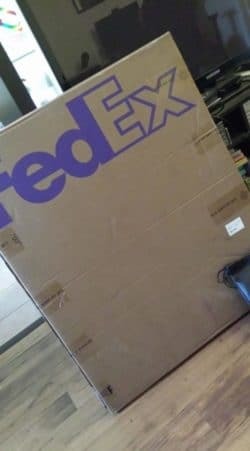 A couple weeks ago, I got a knock at the door and a package roughly half-as big as I am. The original artwork for the cover of Overclocked had arrived and I was beyond thrilled. If I were a better marketing-person, I would have done an unboxing video or something, but to be perfectly honest, I was too excited to care just then. way through a project, so I started searching artists alley and vendor halls at conventions on the theory that if an artist had the drive to get all their ducks in a row such that they could show up and table their work, they might also be someone I could work with professionally. I stumbled across Blacquiao’s table on the final day of APE last September. It had been a weird show – a buying crowd, but a nearly empty floor, and I was exhausted. I’d already lapped the floor once on my first day there, and hadn’t seen anything, but I was giving it a second look. 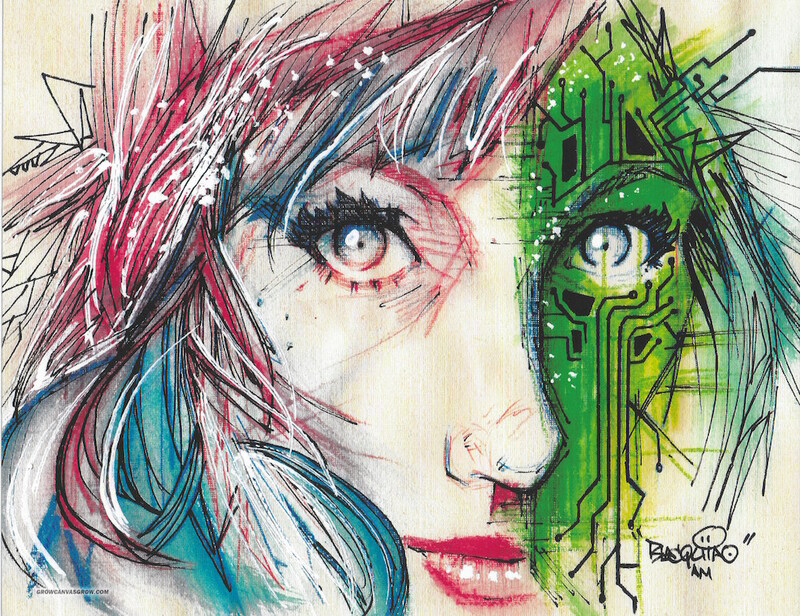 A woman in one of his prints drew my attention, and when I flipped through his prints, and saw Tech Girl, I knew I found an artist I wanted to work with. I bought the print on the spot and asked after his commission rates. It took a couple weeks to work up the nerve (money was tight and artists intimidate me) but I finally reached out and contacted him again in October. Blacquiao agreed, and we were in business. The results pretty much speak for themselves. The art Blacquiao created was gorgeous, and he sent me the original, framed, as well as the sketches, which is far above and beyond what I would have expected. 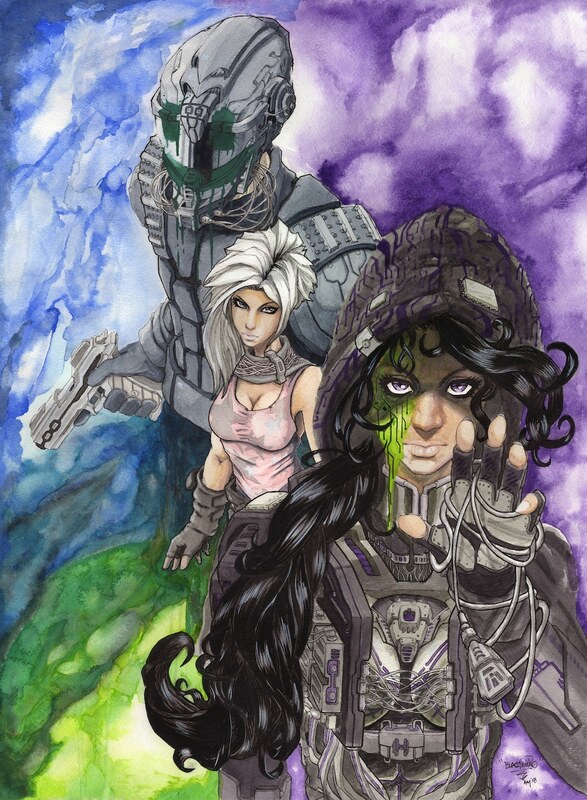 It looked so good that I went back and commissioned another one for the cover of Book 1: Defrag, since my amateur photoshopping efforts looked pretty rough by comparison. Having the same artist across all covers should also help lend unity to the series when they’re spread out across a table at my next con. Amazon, in this case, is your friend. Search up your genre and scroll through the covers. Notice what stands out to you. Pay particular attention to font and title/author placement. Leave room in your design for a title and your name. Leave lots of room, and make sure your cover artist is aware of the need for that space. This is something I failed to account for, and some really beautiful detail work at the bottom of the image is now lost behind the title. I learned. Check your dimensions. Even if you don’t plan on going to physical print with your book, the same laws of cover dimensions still apply across e-commerce sites. Pick a dimension and stick with it. I myself went with 5.5 x 8.5, since that’s a standard trade paperback size and every printer out there will be able to work with those dimensions. Pick an artist you trust, and then trust them. Cliches notwithstanding, people can and do judge books by their covers, making them the single most powerful marketing component, at least when selling your first book. That’s rough, since we’re authors after all, not graphic designers, but there it is. Set your standards high for the artist you want to work with, and if they tell you an element won’t work, or make a recommendation, listen to them. They’re the expert after all. I hope that’s helpful to fellow cover-newbies out there. I’m already looking forward to the new cover for Defrag. Maybe this time I’ll even restrain myself enough to make an unboxing video. Have you ever worked with a cover artist? What was your experience? Any tips you want to share? Leave ‘em in the comments or hit me up on Twitter @rachelthebeck. Loved this – especially the tips section. Some really solid ideas in here. Thanks Rachel! 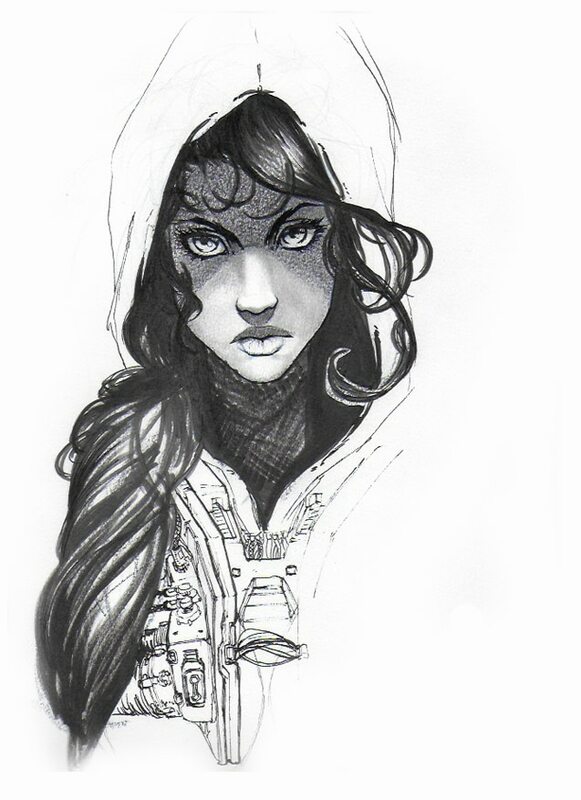 I have read the chapter of glitch so far and I have the honor of knowing the artist Blacquiao! And I think both the artwork and the book itself compliment each other very well I’m so glad you two artists are doing work together and collaborating I can’t wait for future work and I think you have an amazing team! I’m glad you think we make a good team – I certainly agree! Blacquiao’s an amazing artist and I’m lucky to have found him when I did.